What does this mean? Is it a rock on symbol? If you know then you’re probably laughing. If you don’t you can either look it up, or keep scrolling because this is an adult humor costume and it is meant to garner laughs, but it may not be suitable for everyone. However, if this costume tickles your taste buds, you have come to the right place! You are sure to shock anyone you encounter in this Adult Walking Shocker Costume, no pun intended – well, puns are always intended, but we literally mean this will shock just about anyone who sees you. While you may need to explain your costume to some people, most Urban Dictionary trained minds will see right through your costume, and will get the joke! Hand gestures can say a lot of things. Some of these things can be nice like a thumbs up or a peace sign, while others can show anger like the raised middle finger. Now when your index, middle, and little fingers are raised, with the thumb and ring finger tucked away, you will have to make your guests guess as to what that means. 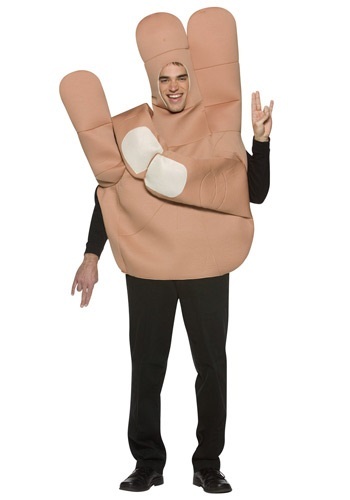 This costume is just a polyfoam hand tunic, with the fingers positioned into the shocker gesture. While it may be simple, nothing else is needed. You are sure to surprise everyone with or without a flashy costume. The costume is 100% polyester, and 100% comical!